It was a pleasure to attend the opening night of Jamie’s new touring show, Making Magic at the Grand Theatre in Lancaster, described by Dickens as one of the loveliest little theatres in the land. 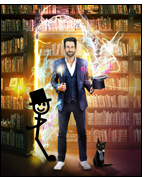 It is the perfect venue for a magic show, and the premise behind this one is that randomly chosen members of the audience can be turned into magicians as well as assistants. It’s the first time I’ve seen an opening sequence encouraging people to keep on their mobile phones and take pictures/videos at any point during the show! The evening begins with an on-screen ‘Jamie of the past’ (ostensibly recorded during the World Cup) who asks a few trick questions to warm up the audience before relating to the ‘live’ Jamie of the present and making several predictions; one of which guides the choice of the bizarre costume which will be worn by the box-jumping assistant Henri White. Audience members are invited to take selfies, upload them to social media then post them to Jamie’s crew, who select volunteers by means of a ‘randomiser’. It must be a first. Jamie sets out seven principles behind magic, asking the audience to look out for them as the evening progresses. It is so refreshing to sit in the middle of a real audience and feel their response to classics such as the Linking Rings, Five Card Repeat (presented in honour of Wayne Dobson) Multum in Parvo and the Multiplying Bottles, with the woman next to me spontaneously crying out “no way!” when the newspaper into which a jug of water had been poured turned out to be as dry as a bone. Jamie reacts wonderfully well to children, helping them to read out instructions when necessary and never belittling anyone . . . even turning the tables on himself as the ‘bad guy’ when a cute little chap seems to be about to have a cup of water poured over his head, only for the liquid to evaporate. There is some impressive close-up work with cards and coins, projected onto a large screen. There are plenty of groan-worthy gags, an original audience participation piece to end part one with a collective gasp, and a drawing together of themes in a final revelation which structurally takes us back full circle to the opening remarks. In the toilets afterwards (the best place to overhear unguarded comments) the punters were genuinely delighted with the evening. It was Wayne Dobson himself who said that if they like you they will like whatever you do, and this is true of Jamie. His rapport with all volunteers is exemplary, and he is willing to stay around in the foyer for as long as it takes for photographs and a chat . . . so do yourself a favour and become a normal spectator again. At least you can be certain of a hug and a photo opportunity.